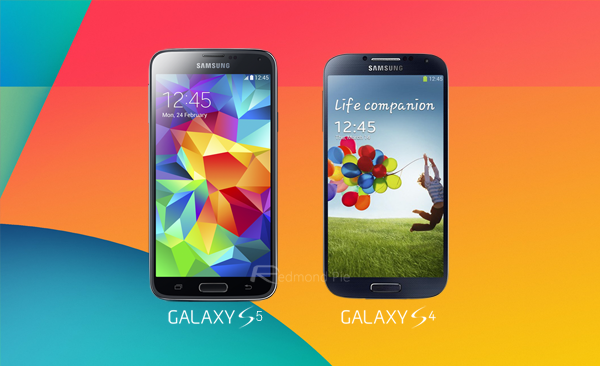 The Galaxy S5, which Samsung announced a couple of weeks ago at the Mobile World Congress in Barcelona, has yet to see the light of day in the retail market, but with the device having been handed out to a select few industry insiders already, we’ve seen a steady increase in new videos and close-up coverage of the eagerly-anticipated handset. Following the extensive hands-on clip we saw yesterday from Eldar Murtazin, he’s back with a comparison video of the Galaxy S5 and the preceding Galaxy S4, offering a vivid, first-hand look at how the upcoming device holds up against the current flagship. With the build-up to the Galaxy S5’s arrival suggesting such treats as a metallic finish, retinal-scanning feature and quad-HD display, it’s not hard to see why some folks have been left feeling underwhelmed by what Samsung has announced. And even though some have been taken in by the 4K video capture, fingerprint sensor and vastly-improved health and fitness-related toys, others have suggested that the device is far too similar to the Galaxy S4. Thanks to yet another Murtazin video, those intrigued to see for themselves how the S5 looks and runs against its older brother can now do so. The clip, which is eight minutes in length, takes a look at the respective form factors of each device, comparing some of the exterior tweaks that Samsung has made with regards to design. Murtazin also, albeit briefly, takes a look at the fluidity of the S4 and S5’s software, and although this is by no means the kind of strict, conditioned test that we’ll begin to see as the Galaxy S5 becomes more readily available in the coming weeks, it does offer a general idea of what the consumer will be getting by upgrading their hardware. With the HTC One 2 set to be announced before the Galaxy S5 makes retail, it will be intriguing to see whether the Taiwanese company can steal some of its rival’s thunder once more. Last year’s HTC One, although not close to matching the sales of the Galaxy S4, certainly captured some of the market that would otherwise have been occupied by the Korean outfit, and with a lingering feeling among Samsung fans that the S5 simply isn’t enough of an upgrade, the likes of HTC, Sony and LG will be waiting in the wings to pounce. Anyway, check the comparison video below, and be sure to leave your comments via the usual channels.